The solvent used is typically tetrachloroethylene (perchloroethylene), which the industry calls "perc". It is used to clean delicate fabrics that cannot withstand the rough and tumble of a washing machine and Dry Cleaning is any cleaning process for clothing and textiles using a chemical solvent other than water. 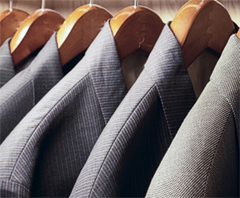 For over 30 years we have been providing specialist dry cleaning services in Troon. Through a combination of investment in the latest technology, using the best available solvents and chemicals and by employing skilled employees, we provide an excellent level of service. 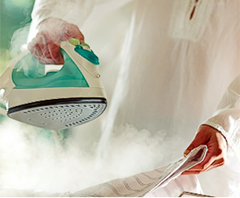 As well as providing a total service package for all your dry cleaning, we also provide laundry and ironing services. All garments will be inspected prior to cleaning. We will then remove any stains by hand before the cleaning process begins. Again we will inspect your garment after the cleaning process to ensure stains are removed where possible. All garments will be recleaned if the stain has not been removed. Garments are then had finished using steam & ironing systems. 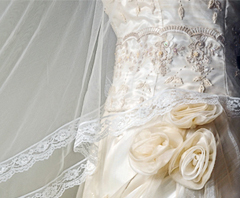 We can cater for all dry cleaning needs including Wedding Dresses, Kilts and household items. Dry cleaning curtains involves movement in the processing. This can exaggerate weakness in your curtains – for example sun damaged linings can tear and sun damage colours can lighten. Most curtains shrink 3% in dry cleaning especially if cleaned for the first time or if they have interlining. Blackout linings can only be accepted at owners risk - there is a risk of the rubberised part de-laminating. (specialist cleaning only with its lower temperatures).